I am Suma Bijoy. Born on the 20th October 1988. My Schooling was at St Aloysius High School, my Plus Two in Adarsha Vidhya Bhavan. 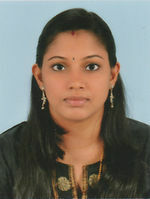 I did my Graduation in Mathematics from Calicut University. Along with I have completed GNIIT in NIIT. My interest is to do innovative things for myself and make more creative especially in area of technology. I want to explore the aspects of e-learning for trainee teachers so that they can implement its usage in schools. This page was last modified on 6 July 2013, at 12:39.